Living Earth Center, Mankato, Minnesota. As part of the Our Lady of Good Counsel Campus, the Living Earth Center (LEC) sits atop Good Counsel Hill in Mankato, Minnesota, where it serves as an educational, spiritual and community resource for the surrounding area. The LEC promotes, fosters and recognizes the interconnection and interdependence of all life. By embracing people of all spiritual paths, the LEC strives toward earth justice and sustainability through education, collaboration, sustainable agriculture and political advocacy. One of the purposes of LEC is to model environmental stewardship through ecological awareness, ecosystem restoration, support of local food production and environmentally sensitive maintenance practices. In addition to a library and resource center, the LEC manages a two-acre organic community garden and hosts workshops and spiritual enrichment programs throughout the year. 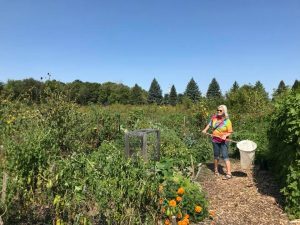 Living Earth Center has grown to be a large network of gardeners, volunteers and advocates who are finding common ground and building a resilient community that honors the connection of all things and the value that all bring to this Living Earth. Living Earth Center cultivates sustainable environmental, social, and organizational solutions that have positive long-lasting effects. Living Earth Center provides opportunities where minds can be opened, ideas can be shared, and growth can take place. Living Earth Center empowers action and advocacy to bring about systemic change. Living Earth Center collaborates and cross-pollinates ideas and strategies that help to make a healthy thriving local and Earth community. Living Earth Center values diversity within eco, social and Earth systems recognizing the connectedness of all. Living Earth Center embraces all spiritual paths and encourages deeper relationships with self, each other, Earth and the Universe. Living Earth Center is a good steward of the Earth and its people. The SSNDs in Mankato, Minnesota, had a working farm for more than 60 years that supplied meat, dairy, eggs, grain and produce for the sisters and students who lived there. Due to a variety of social and economic changes and the industrialization of agriculture in the United States, this farm ministry was discontinued by the end of the 1970s. After the farm crisis in the 1980s, however, a renewed interest in small-scale, sustainable agriculture emerged eventually leading to the founding of the Center for Earth Spirituality and Rural Ministry (CESRM) in 1996. As a sponsored ministry of the School Sisters of Notre Dame, CESRM was comprised of committed sisters and community collaborators from all spiritual traditions who were passionate about ecological solidarity and enhancing right relationships between each other, the local community and the greater earth. During the summer of 2018, the Center for Earth Spirituality and Rural Ministry transitioned to The Living Earth Center. The Living Earth Center continues the SSND mission by seeking a sustainable future for all through education, advocacy and collaboration among all spiritual traditions and diverse cultures. Living Earth Center believes that each person makes a valuable contribution to the world and systemic change can be traced to the individual level. Whether you are interested in donating, volunteering, gardening, taking a reskilling class or making more sustainable choices, you are helping to create a ripple effect within the local and greater Earth community. We invite you to become part of the Living Earth Community by visiting the Living Earth Center’s Get Involved webpage. For more information please visit the website, email, download a brochure, or contact Laura Peterson at 507-389-4272.